Rabbit In Red is taking on the time travel and pitching ideas that we would like to see turned into movies in a John Rhoades original called 'The Writers Corner'. After that we delve into the debate that has split the film community down the middle, 'the difference between shooting film vs digital and the viewing of film vs digital. In the second half we breakdown the two films of the week Deathgasm and Krampus which leads to another debate, this time heated, about Deathgasm. Is it as good as Evil Dead or is it just a wink and a nod to a superior film? 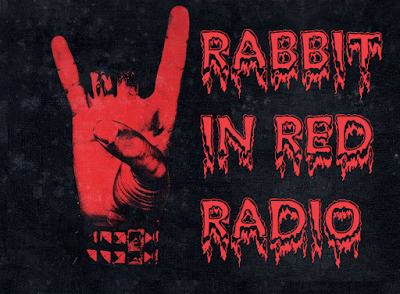 All that and more on this episode of Rabbit In Red Radio. DEATHGASM: Brodie (Milo Cawthorne), an outcast in a sea of jocks and cheerleaders until he meets a kindred spirit in fellow metalhead Zakk (James Blake). After starting their own band, Brodie and Zakk stumble across the hideout of their recluse idol Rikki Daggers (Stephen Ure). Daggers realizes he has been outed and gives Zakk and Brodie a record and tells them to guard it with their life. Once home Brodie discovers sheet music inside and decides to use it for his band. But unknown to them, the music also summons an ancient evil entity known as Aeloth The Blind One, who threatens to tear apart existence itself. After playing the music their classmates and family become inhabited by demonic forces, tearing out their own eyes and turning into psychotic murderers. Krampus: While the holiday season represents the most magical time of year, ancient European folklore warns of Krampus, a horned beast who punishes naughty children at Christmastime. When dysfunctional family squabbling causes young Max (Emjay Anthony) to lose his festive spirit, it unleashes the wrath of the fearsome demon. As Krampus lays siege to the Engel home, mom (Toni Collette), pop (Adam Scott), sister (Stefania LaVie Owen) and brother must band together to save one another from a monstrous fate. Evil Dead 2: The second of three films in the Evil Dead series is part horror, part comedy, with Ash Williams (Bruce Campbell) once again battling horrifying demons at a secluded cabin in the woods. After discovering an audiotape left by a college professor that contains voices reading from the Book of the Dead, Ash's girlfriend Linda (Denise Bixler) becomes possessed by evil spirits that are awakened by the voices on the tape. Ash soon discovers there is no escaping the woods. Project Almanac: David Raskin (Jonny Weston) is a high-school science nerd who dreams of going to MIT. When he and his friends (Sam Lerner, Allen Evangelista) find his late father's plans for a "temporal displacement device," David can't wait to start tinkering. When they finally get the device to work, the teenagers jump at the opportunity to manipulate time in their favor -- but their joy is short-lived when they begin to discover the consequences of their actions. Primer: Intellectual engineers Aaron (Shane Carruth) and Abe (David Sullivan) build and sell error-checking technology with the help of their friends Robert (Casey Gooden) and Phillip (Anand Upadhyaya). But when Aaron and Abe accidentally invent what they think is a time machine, Abe builds a version capable of transporting a human and puts the device to the test. As the two friends obsess over their creation, they discover the dark consequences of their actions.